Ensuite, il faut instancier un container parent et l’utiliser partout dans l’application. Et changer WinRTFilesContainer par notre choix (CordovaDatabaseContainer par exemple) pour l’application cordova en faisant attention de ne l’appeler qu’après l’enclenchement de l’évènement deviceready. It converts spoken audio to text. The APIs can recognize audio coming from the microphone in real-time, or from an audio file. It converts text to spoken audio when applications need to talk back to their users. 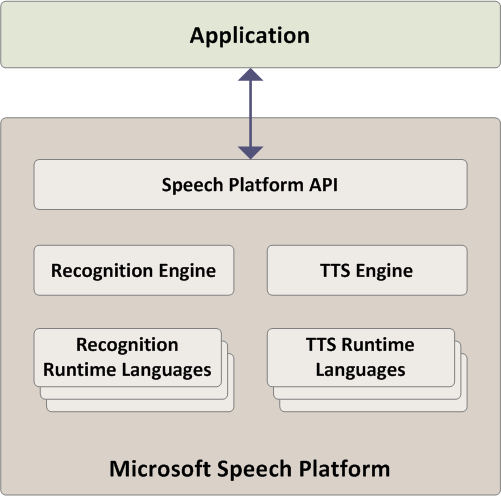 The Speech APIs are included in Windows 10 libraries, and also provided by the project oxford services, which require an Azure subscription. These APIs are in a beta version, they work by sending data to Microsoft servers in the cloud, to use them we must have an Azure account. They also offer the Intent Recognition feature which can convert spoken audio to intent. Using an Azure account, go to the Market Place to purchase the speechAPIs Service (which is for free 😉 ), then retrieve the primary or secondary key. Just in case you are using the Azure DreamSpark subscription, don’t be surprised if you don’t find this service. Unfortunately this type of account does not give access to Oxford Services. Download the Speech SDK of project oxford from here! if you are targeting another platform rather than Windows, have a look here you will find what you are looking for. When using the REST API, we only get one recognition result back at the end of the session, but in the case of a client library, we also get partial result before getting the final recognition. A Data Recognition Client : used for speech recognition with data (for example from an audio file). The data is broken up into buffers and each buffer is sent to the Speech Recognition Service. A Microphone Recognition Client : used for speech recognition from the microphone. The microphone is turned on, and data is sent to the Speech Recognition Service. In ShortPhrase mode, an utterance may only be up to 15 seconds long, As data is sent to the server, the client will receive multiple partial results and one final multiple N-best choice result. In LongDictation mode, an utterance may only be up to 2 minutes long. As data is sent to the server, the client will receive multiple partial results and multiple final results. been parsed with LUIS for intent and entities, and the structured JSON result is available. OnMicrophoneStatus : Event fired when the microphone recording status has changed. // Data Client event from an audio file for ex. // Send of audio data to cloud service. The TTS feature of project oxford can be used only through the REST API, and we have a complete example here. The API uses HTTP POST to send audio back to the client. The maximum amount of audio returned for a given request will not exceed 15 seconds. Windows 10 Speech APIs support all Windows 10 based devices including IoT hardware, phones, tablets, and PCs. Make sure that Windows Universal App Development Tools are installed in VS2015. First of all we have to create a Windows 10 Universal application project in visual studio : New Project dialog box, click Visual C# > Windows > Windows Universal > Blank App (Windows Universal). Double click on the file Package.appxmanifest > Capablilites > Microphone > select the check box. Note: The Windows 10 Speech APIs are using the languages installed in the Operating System. The STT feature using Windows 10 APIs works in online mode, if we want to make it available in offline mode we have to provide the necessary grammar manually. Continuous recognition sessions for prolonged audio input. A continuous session needs to be either explicitly ended or automatically times out after a configurable period of silence (default is 20 seconds). Speech recognition session for recognizing a short phrase. The session is terminated and the recognition results returned when a pause is detected by the recognizer. Completed : Occurs when a continuous recognition session ends. ResultGenerated : Occurs when the speech recognizer returns the result from a continuous recognition session. We have another event tied to the speechRecognizer object, which is the HypothesisGenerated event, occurs when a recognition result fragment is returned by the speech recognizer. // The recognizer can only start listening in a continuous fashion if the recognizer is urrently idle. // This prevents an exception from occurring. This feature is available in offline and online mode, to make it works we have to create a SpeechSynthesizer object, then we set the speech synthesizer engine (voice) and generate a stream from the speechSynthesizer.SynthesizeTextToStreamAsync method by passing the text we want to read in parameter. What is an App Service ? Windows 10 introduce a bunch of new ways for applications to communicate with each others. One way is to implement « App Services ». App Services are a request/response model where one app can call a service located within another app. App Services enable communication between apps, but also with the system. If you want to implement interactive scenarios with Cortana, you will have to implement an App Service to provide data to Cortana. If you’re the kind of people who prefer code than blabla, you may head directly to the github repository with sample applications. App Services use the same infrastructure as BackgroundTasks, and most of the logic and implementation details still applies. It means that when your service is called, you don’t have the whole application running, but only your service. It also means that your application don’t communicate directly with your App Service. For example, your application does not get notify when your service is called, or terminated. Show me some code ! The first step to implement your App Service is to create this file. As with web workers, you could use « importScripts » to reference any code you want to share between your app and the service. Be aware that, like with Web Workers, there is no « window » or « window.document » objects inside your background task or app service. The global context points to a completely different beast, and there is no DOM. Inside your task or service, you will access to the current instance of the BackgroundTask object using WinRT APIs, and get a deferral on it to control the lifecycle of your service. As with background task, your service can also be canceled by the system if it needs to recover memory, or if battery is running low on the device. Your task instance provide a « cancel » event that will get caught is such cases. Now we must implement the service logic. To do that, we will check the trigger details on our background task, and register for a request event. When the event gets activated, we received an App Service request. This request will contains a message (with request arguments), and a sendResponseAsync method to reply to the caller. On both sides, the values in the request and in the response are provided with a ValueSet object. Calling the app service require some arguments, the caller should provide the package family name (PFN) of the target application, and the name of the App Service (as declared in the target’s app manifest). If you don’t know your PFN, you can get it through WinRT APIs by calling « Windows.ApplicationModel.Package.current.id.familyName » in your service application. Using the PFN and service name, you will first get a connection to your App Service, and register to the « serviceclosed » event to be notified if your service terminate. And voilà ! you’re ready to go. A picture is worth a thousand words, so I put a sample with service and caller apps on github for you. If you grab the sample, you can see how easy it is to debug your service. If you configure the solution to run both caller and callee on debug, you can set breakpoints in your app service. If you don’t want to run the full service app, you could also edit the properties of the project hosting the service. In the debugging section, you could set « Launch Application » to false. In that case, when you run debug for both apps, you will only see the caller application starting, but your breakpoints in the app service will get called appropriately. Windows 10 is still in preview, and as of this writing, a lot of the samples available are written in C#.